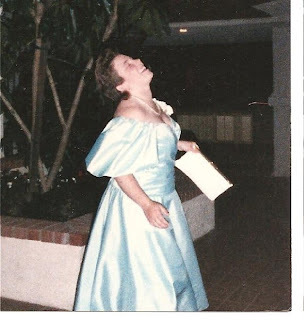 My Journey to Fit: Grab Your Corsages, Feather Your Hair - It's Prom Night! Grab Your Corsages, Feather Your Hair - It's Prom Night! 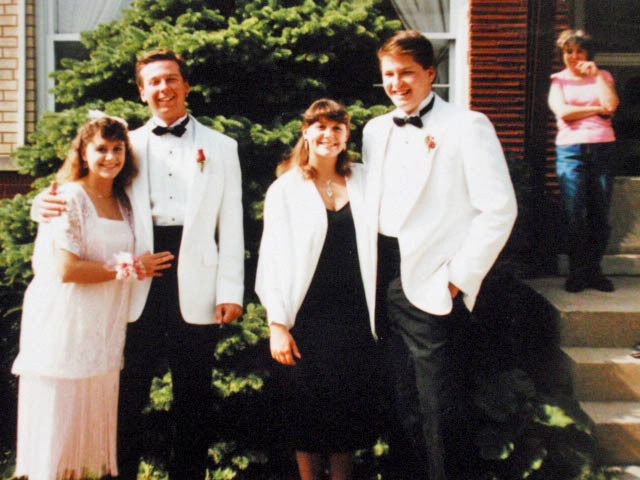 Forget that you might be reading this at 6:00 am, forget that it's a Monday - just close your eyes, step back in time, and let's go to the Prom! Our theme tonight is We Will Never Pass This Way Again. The band will be playing covers by Air Supply, Little River Band, Chicago, and Bread. Refreshments are on the table in the back of the room, and the Assistant Principal, Mr. Pastorini, will be standing guard to make sure no one spikes the punch. Have fun...but don't dance too closely! Circa 1986 - Jenn is on the left, Biz is on the right. How much do I love that Biz matched her date's white dinner jacket outfit?!? And Jenn is a vision in Madonna-lace. Awesome! Next up is Helen of Doing a 180. 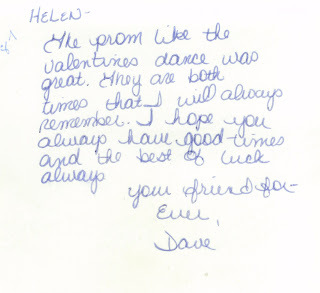 She attended both the Prom and the Valentine's Ball with the same date - her next-door neighbor. Everybody: awww! Love the Gunne Sax dress, my sweet baby-faced friend! 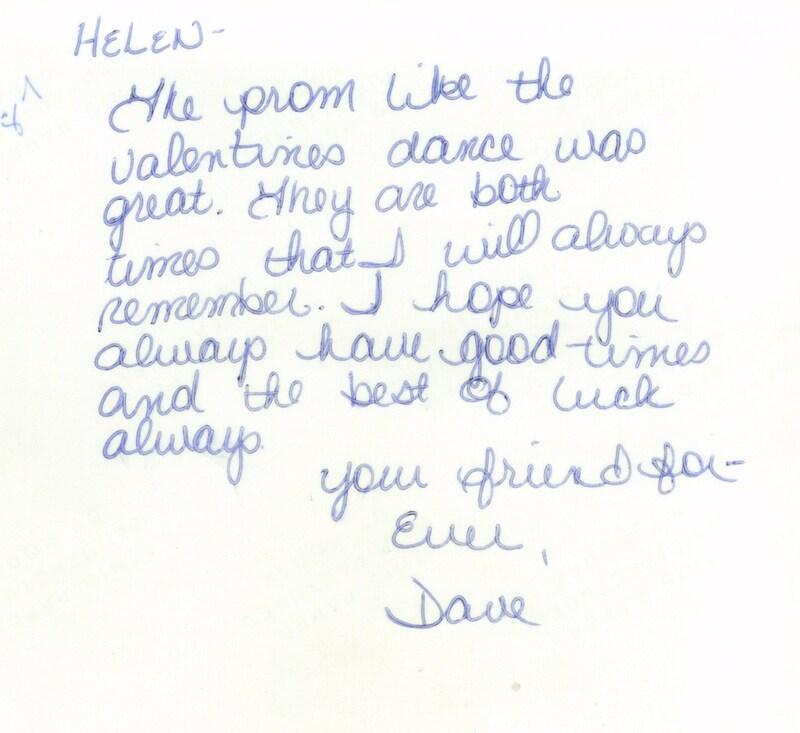 Dave sounds very sweet, but I hear they lost touch and did not, in fact, stay "friends forever" - wonder if he's on Facebook? Love the look on his face! Also, his satin vest matches her dress perfectly! A full shot of Stacia in her dress, with sleeves she "coulda smuggled a gnome in" - I love how blissfully happy she looks in this shot. Here's Marisa from Loser For Life, in her fabulous 80s big hair and Dynasty-inspired (I'm sure) puffy shoulder dress. 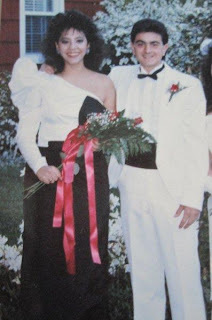 That is quite the nice bouquet of roses you're holding, Marisa - was this your corsage? Wow! Next up is Kelly from Happy Texans, who is wearing a beautiful dress that her very talented mother made! Circa 1989 - the year my second son was born (funny how different our lives were back then, and yet how similar they are now). Kelly, you look so young and gorgeous! Circa 1988. Doesn't her date remind you of an 80s movie star? My mom and dad! 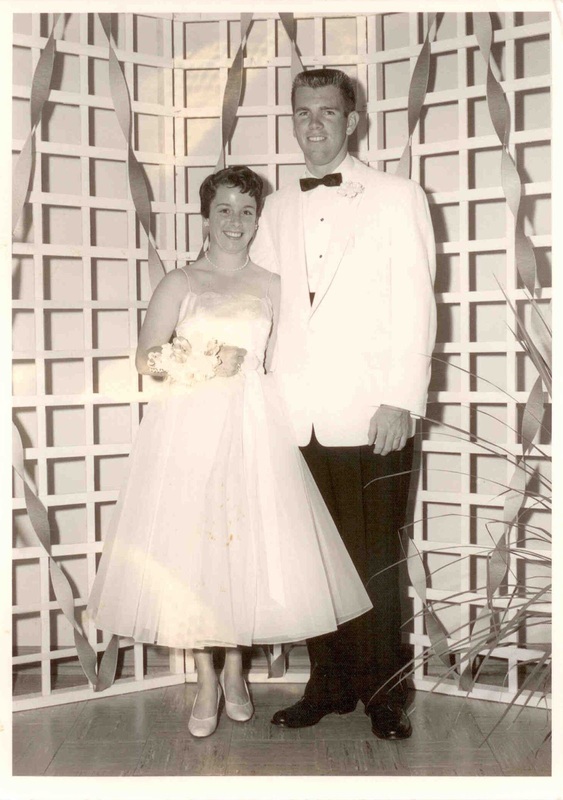 This was their prom - 1959. They were 17, but I swear they look even younger! And in keeping with the theme, my grandmother made my mom's dress! I have no idea why I wore green socks with that outfit. Peach does not go well with my pale skin. Plus I was just coming off of my anorexia period and was still too thin - doubtful I was even up to 100 pounds in that picture. 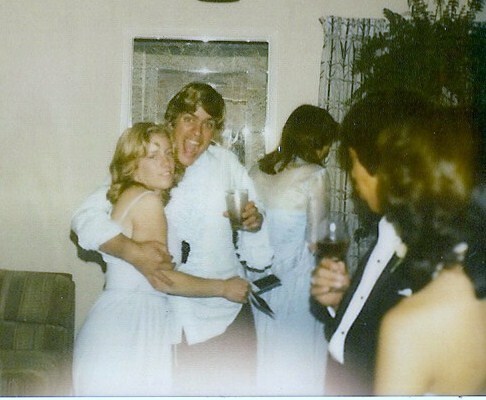 And here's one more picture - from the after-prom party that we went to. No alcohol-free lock-ins for us! I worked at Baskin Robbins with the guy who is hugging me. Also, if you look closely, I am the only one in the picture who is not holding a drink - I was keeping track of the incriminating Polaroids! 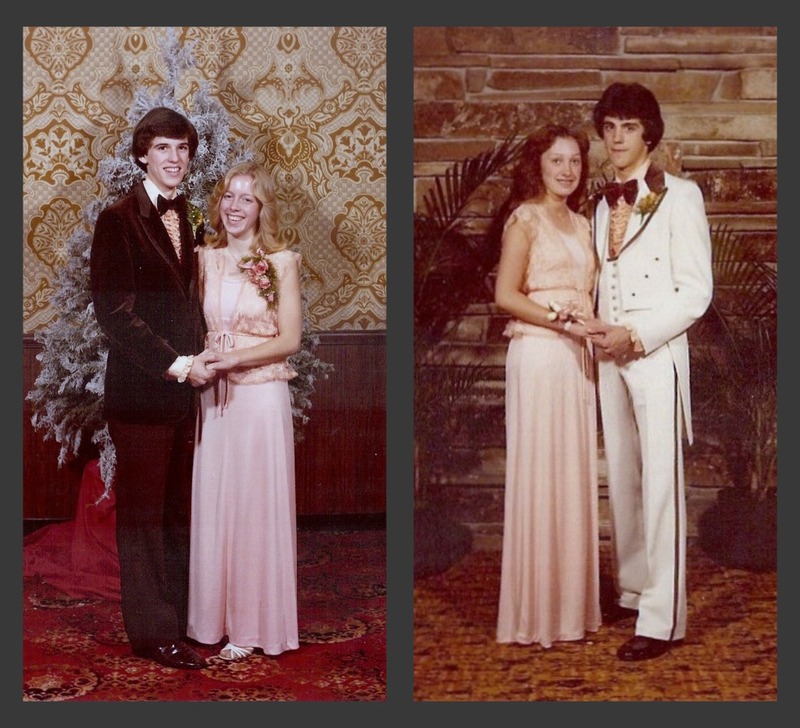 Thank you to my fantastic readers who submitted photos - you all looked so young and vibrant and beautiful. 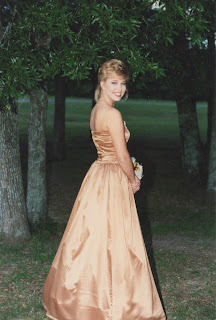 I love that you played along with me in this look back at our FABULOUS teenage style! Have a great day Shelley! hey you quoted me :) thanks for the laugh!!!!! What a great post, I loved watching the pictures. 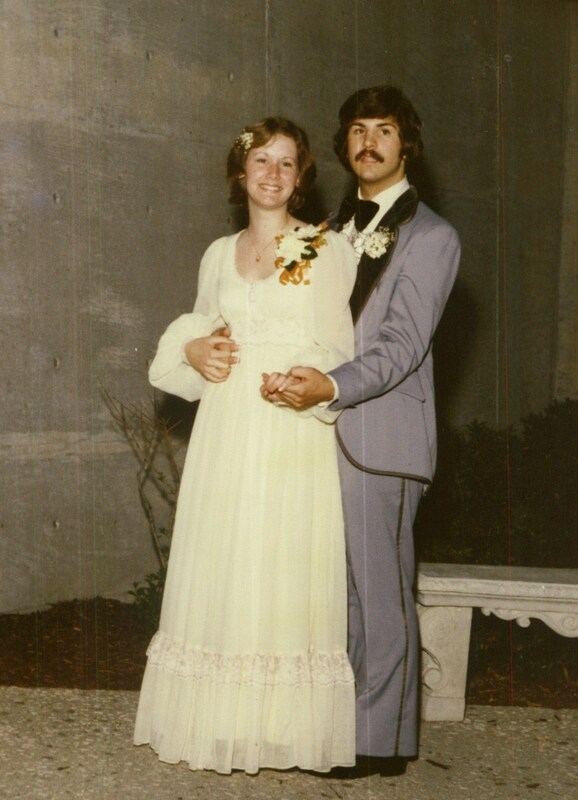 As mentioned before we don't have prom night but I do wish we had. This was just FUN! Thanks for the work you put into it, these photos were precious. I love the little tinge of nervousness I see on the faces and the dresses are just great!!!! The Oakie Stomp was my favorite!! Perfect post for prom season! Don't all those ladies look beautiful! Hey! Just noticed my twin Lori did not go to her high school prom either. This was fun to see! 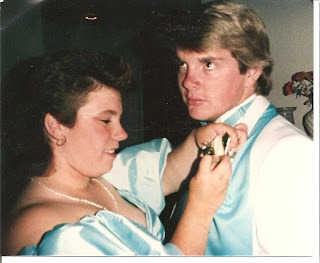 Ditto on not going to the prom. Oh, the years of therapy to be able to say that without tearing up. But, this was GREAT Shelley, think of the book opportunities. Faboulous! Everyone looks just fabulous and era appropriate! 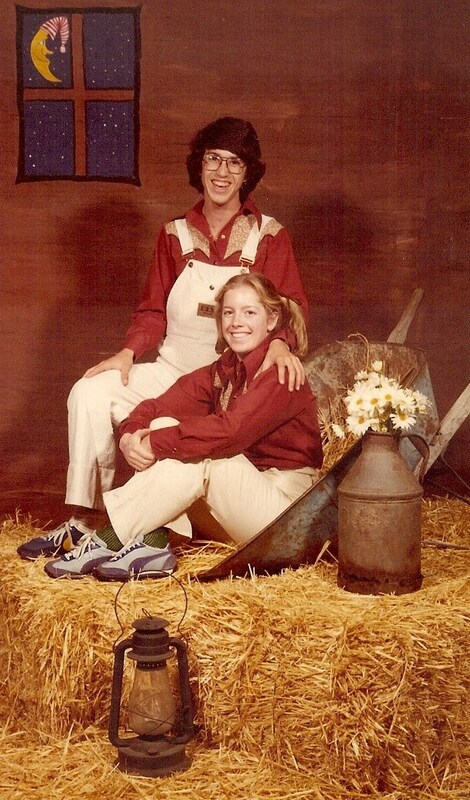 Did you and Gail also share your date? Because those guys look interchangeable! Love it!! Great photos and I'm glad I'm not the only 80's one in there!! Love the big hair/puffy dresses! That was fun. 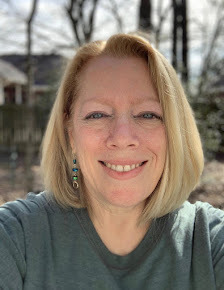 I like my mom on the porch standing behind B & J.
I know I sent you a photo. Too bad it was of a complete stranger or you would have posted. I shouldn't have been discriminated against because I was dating and eventually married (for 25 years) to a man who refused to take me to my prom. 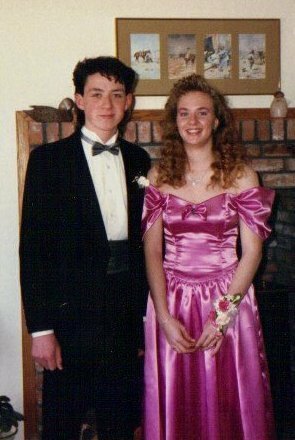 I'm thinking the fact that he refused to take me to my prom should have been a clue as to what type of guy I eventually married. As I age and my real eyesight is failing, why is it all this life stuff becomes so crystal clear. Such a paradox and kind of funny. Good thing they can't steal my sense of humor until they steal my brain. OMG...these are HILARIOUS!!!! So glad you posted these Shelley! Have a great day! This was really fun! Why are the poses so universal? And why did we ever think Gunne sax dresses were the sh*t? what a fun post! Makes me feel not as embarrassed about my grad pictures..ha ha totally kidding! What a FUN post! LOVE it. I've been MIA so I missed out but will have to get in on the fun next time. Aaaah, sorry I am late to the post-prom party!! Been doing too much partying myself! Haha, the photos were fun, although I'm a little mad that some of the ppl look too normal. ha Not long ago enough maybe? But now the Oakie Stomp..that made me laugh out loud. :) And from green socks, to coordinating visors, socks, ipod, probably sports bra...haha Makin' up for lost time.